Supporting charities, both locally and nationally, is very important to us. That’s why we are always happy to look silly or test our endurance levels to the limit, as long as it means more for those who really need it. Portafina helps village to pump it up: we were truly blown away to receive this update from AquAid. It shows the well that has been built for a community because of our contributions to The Africa Trust…and makes us really appreciate some of the basics we take for granted. 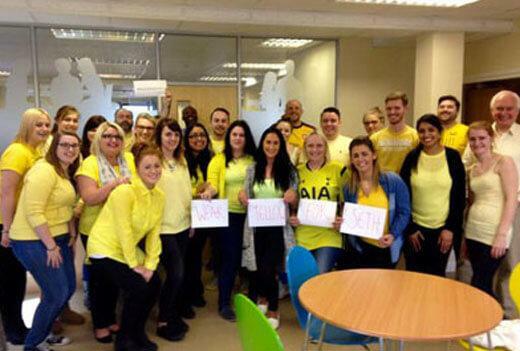 They call me mellow yellow: We wore our sunniest outfits to support Cystic Fibrosis Trust, Wear Yellow Day! We even posed for #CFYelfie and we challenge you to do the same by wearing your finest yellow and help raise awareness and support for those affected by cystic fibrosis. 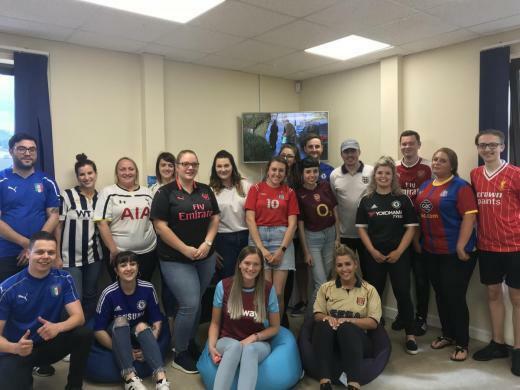 It was football shirt Friday! In true Portafina style, we wore our clubs and nations shirts with pride to support the Bobby Moore Fund. We raised an amazing £100 which will help to beat bowel cancer sooner. Check out the colourful display of jerseys in the breakout room! Wear A Flower Day: It wasn’t just mother nature that was in full bloom in the gorgeous Spring weather. The Portafina family also blossomed in florals for Wear a Flower Day, in aid of two fantastic charities. We managed to raise an amazing £209.38 by bidding for a staff member to wear a flower costume, as well as a collection in the afternoon! The money raised has gone to Marie Curie to help those with a terminal illness and their families and to local charity, Holding On Letting Go that helps children in Medway cope with the death of someone close to them. 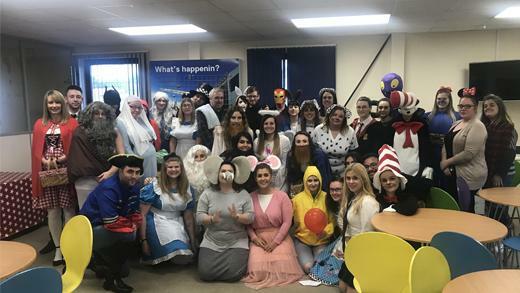 World Book Day:The snow may have postponed our World Book Day for a week, but that didn’t stop us following the kids lead and dressing up as our favourite book characters! We had all different characters walking through Portafina towers, from Angelina Ballerina to George from IT! Raising £80.59 for BookAid, it was a fun day indeed! Sport Relief: We celebrated Sport Relief with our competitiveness, got our gym gear and trainers on and got stepping to help the nation hit its goal of 1 billion steps by the end of day. Not only did the UK hit its target, we raised £196.50 for Sport Relief continue their great work for those in need in the UK and around the world. Endometriosis Awareness Month: We welcomed March with Endometriosis Awareness Month. A painful and debilitating condition, Endometriosis affects one in ten women in the UK and is often treated as a taboo subject. 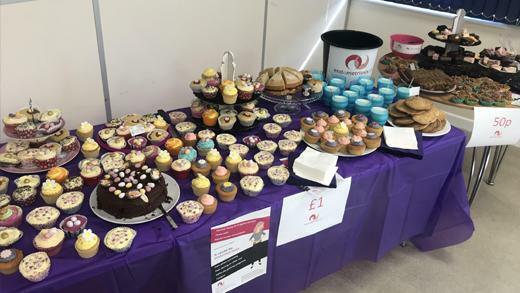 In true Portafina style, we helped turned that around with a cake sale of delicious treats and raised £151.26 to help Endometriosis UK continue its vital support for women who are suffering with the condition. 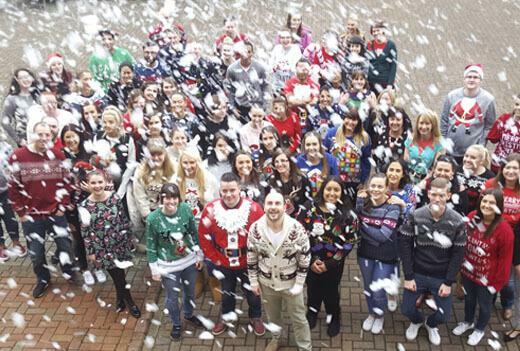 Christmas Jumper Day: Another year passes and it simply wouldn’t be the same without busting out our festive jumpers and rejoice in the Christmas cheer! We raised a great £117.00 for charity, Save the Children on 15th December. Pyjama Day: There were quite a few of us got out of bed on the morning of the 17th November and didn’t bother getting dressed in our work clothes…all for a great cause, of course! 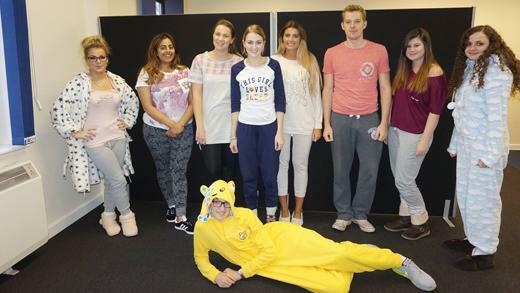 By working in our pyjamas, we managed to raise a cool £220.00 for Children in Need. World Diabetes Day: World Diabetes Day proved a busy day of creating awareness, from donning our best blue attire, to a raffle and then putting our minds to the test with a quiz, later that evening. 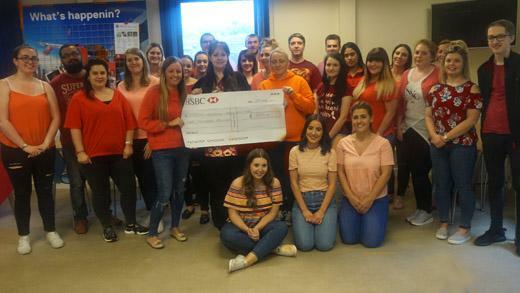 We raised a fantastic £414.90 for diabetes charity, JDRF supporting them to continue the great work they do in research type 1 diabetes. Orange is for Carol: Facing cancer always calls for a special kind of courage and strength. Today we remembered our own Carol Cooke, who sadly lost her battle with cancer earlier this year. As well as raising £500 for the Wisdom Hospice (which included the sale of some absolutely delicious cupcakes!) we all wore Carols favourite colours – red and orange – to honour her memory. Hair raising fun: Any chance to take a break from the suits and formality, we’ll grab with both hands. And we’ve been using those hands to mould and colour our hair in crazy ways. We raised £108.38 to support Comic Relief and all fantastic work they do. Some of us had more original material to play with than others! World Cancer day: Anyone affected by cancer is a superhero in our minds. To commemorate all those that have been impacted in some way, we challenged our teams to create their very own superheroes with less than 6 items. We also held our very own superhero bake sale to raise money for the charity and managed to generate £117.36. Christmas jumper day: Another year, another opportunity to wear our brightest and most festive clothes. The team donated for the cause and raised £110.28 for diabetes charity JDRF. 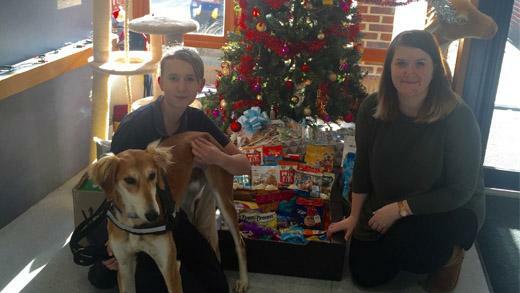 RSPCA: Every year, Claire Ayaz collects donations for animals without homes at Christmas. As a company of animal lovers we helped her break her previous records and collect 190 snacks and toys to keep the animals entertained over the holiday. Circus Starr: The Circus Starr tour has given millions of underprivileged and disabled children the chance to forget their troubles for a day at the circus. We bought 10 tickets for children to enjoy the spectacle at their local venue. Movember: The boys endured itchy faces and some interesting new looks for the Movember Foundation, raising over £150 in the process. Pyjama party for Pudsey:Getting out of bed in the winter is a lot easier when you’re wearing your pyjamas and dressing gown to work. With a bake sale and staff donating to wear their comfy casuals we raised £182.57 for Children in Need. Monster Dash & Running Scared: We were thrilled to be one of the headline sponsors for this spooky running event by Demelza Hospice. Participants tested their nerves (and legs) against witches, devils and gunge in this charity run. Partnership with Demelza House: We have chosen Demelza House as our nominated charity, to support the incredible work it offers. 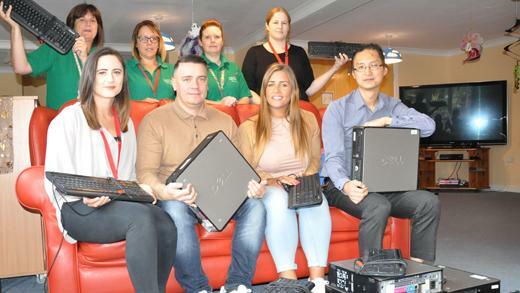 We’re starting off by donating computers and will be joining the team with various fundraising activities, from fitness challenges to volunteering. Macmillan coffee morning: The Portafina team consists of many baking enthusiasts, and their efforts helped us to raise £209.70 for Macmillan cancer support. 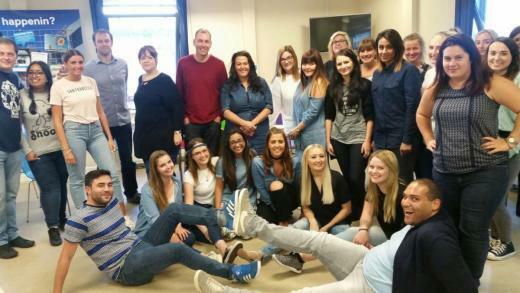 Jeans for Genes Day: Clad in more denim than you can shake a stick at, we raised £248.28 for the Jeans for Genes charity, helping the thousands of children diagnosed with genetic conditions each year. Making a racket for TAG: Combining Wimbledon with charity we wore blue in support of The Arthrogryposis Group and sold strawberries and cream, raising more than £220 as a result. 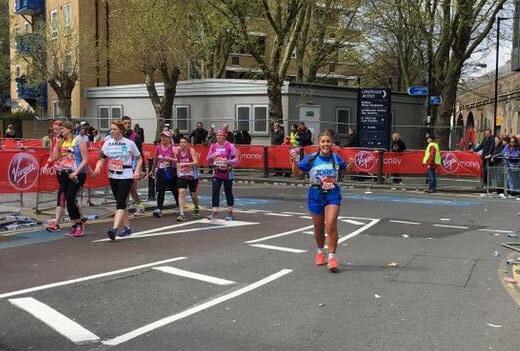 Keep on running: Hell-bent on lung-busting glory, Claudia Hill ran the Virgin London Marathon, helping to raise more than £7,000 for diabetes charity JDRF and taking in the city sights at the same time. Christmas jumper day: Our team pulled out all the stops with their 2015 Christmas jumpers – there were even some homemade efforts. The result was £120 for diabetes charity JDRF. 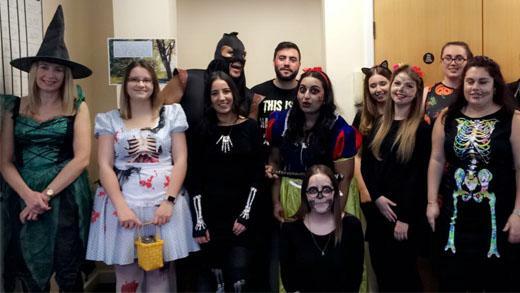 Freaky Friday Fundraiser (Halloween): We raised £338 for diabetes charity JDRF with a bake off special and cake sale, fancy dress and various ghoulish goings-on. Bad Shirt Day: We raised £294.20 for Hemi Help, a charity for children and young people with hemiplegia. 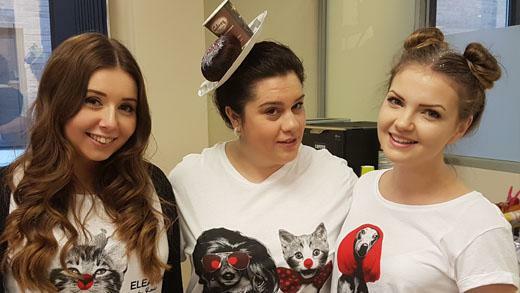 Staff paid for the privilege of wearing to work their worst ever shirts, and a cake sale help to boost the total. Paige Stewart Appeal: Paige is a four-year-old girl with periventricular leukomalacia and cerebral palsy spastic diplegia, and her family is raising money to fund an operation for her. We donated £475 to a 5km sponsored walk. Wear Yellow for Seth: Seth Lane, a personal friend of a member of our staff, was born without an immune system and his request for people to wear yellow in support of his operation became a viral story with the hashtag #WearYellowForSeth. We showed our support and raised over £150 for Seth. Vicky’s School of Dance: We gave this local dance school for girls £1,200 to help out with studio costs. Boxing clever: In the past two years we have donated £1,200 to St Mary’s Amateur Boxing Club, a registered charity that trains juniors and adults. Christmas jumper day: Another day of festive flourish as the team donned their finest knitted wardrobe warmers and raised £157 for JDRF. Happy Halloween: Fancy dress, a cake sale and raffle helped us to raise £1,364 for diabetes charity JDRF. Charity boxing matches: Jamie Smith-Thompson, our adventurous managing director, took part in two charity boxing matches in 2014. The tragic death of 23-year-old husband and father Ryan Glenny to bowel cancer resulted in a fund for his family of over £75,000, which the ‘Gloves on for the Glennys’ bout contributed to. The second event, ‘Clash for Cancer’, raised almost £14,000 for cancer research. Supporting local teams: We gave local under 11 football team Pegasus 81 Flyers £1,000, which helped towards new kits, training equipment and a tour of Wembley stadium. Silverstone Half Marathon: Jamie Smith-Thompson raised almost £900 for JDRF, the world’s leading charitable funder of type 1 diabetes research, by completing the Silverstone Half Marathon. Virgin London Marathon: Jamie Smith-Thompson (there are others who run in this company!) raised over £2,150 for Children with Cancer UK when he completed the gruelling 26-mile London Marathon. 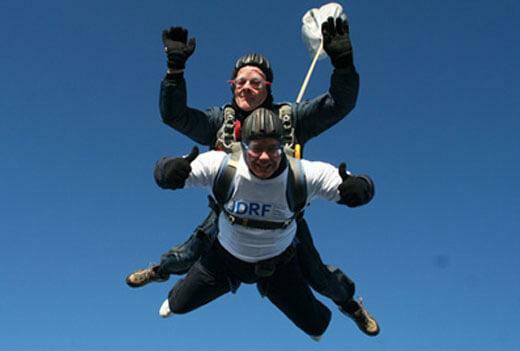 Skydive: Jamie Smith-Thompson and Michael Paynter raised £775 for diabetes charity JDRF by jumping out of planes. Watch the action on our videos page. 3 Peaks Challenge: Jamie Smith-Thompson and Michael Paynter scaled the 3 peaks in 2010 and raised £1,725 for Demelza Hospice Care for Children.